The red bumpy skin does not always leave after the teenage years. 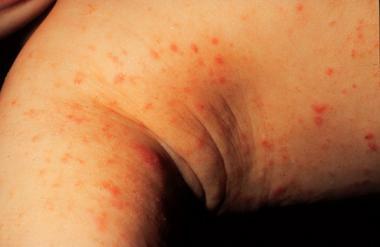 Many adults have skin conditions that present red, itchy bumps as well. In most cases, the bumps are minor conditions; however they can still very embarrassing. On the other hand, there are some conditions which may be more painful and may indicate signs of other health conditions. This article will present you with some of the most common causes and treatment for small red, itchy bumps on your skin. There are multiple conditions that can cause red itchy bumps. Below are some of the common ones that you should have some knowledge about. Groups of red welts that sting, itch, and burn on the skin of varying sizes are popularly known as hives. Hives can last for a few minutes or up to several days. Extreme temperatures, allergic reactions, and bacterial infections are the main causes of hives. Identifying and eliminating the trigger is the best way to treat hives; however it may not be the easiest task. You may also find that your doctor prescribes antihistamines to relieve the symptoms. There are several things you can do to treat the hives while you are waiting for them to disappear. Applying a cool compress or a wet cloth, lowering the temperature in the room you are working or sleeping in, and wearing clothes that fit loosely will help relieve the symptoms. 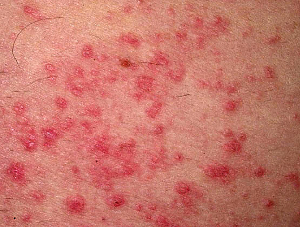 Other small red itchy bumps may be caused by insect bites. There are times that the bumps may also be accompanied by small blisters if you have sensitive skin. Large blisters may also form on the lower legs or shin. Insects such as bees may leave a stinger behind; scrape the stinger off with a blunt object. Use soap and water to thoroughly wash the wound. Gently apply ice for a few minutes. If needed, take a pain reliever. Take a pain reliever if needed. Apply a small amount of hydrocortisone cream. Remove the tick by using tweezers. Clean the wound with rubbing alcohol or soapy water. The inflammation of hair follicles causes small red itchy bumps known as folliculitis. These bumps most commonly form in areas that receive the most irritation from shaving or friction. The folliculitis causes small lesions with pustules on the hair follicles. They can easily be identified by the pink rim of inflamed skin. Use a moist, hot compress. Do not shave if the skin is irritated. Use a new razor or electric razor. Try other hair removal methods. Wash clothes after each use. If the above treatments do not work to relieve the symptoms or clear up your folliculitis after 2-3 days, if the infections spread to other areas and if the symptoms keep coming back, schedule an appointment with your general practitioner. Sarcoptes scabiei var. hominis is a tiny mite that infests the skin causing scabies. Scabies will spread rapidly, especially in crowded areas like nursing homes and hospitals, because it is a highly contagious infection. 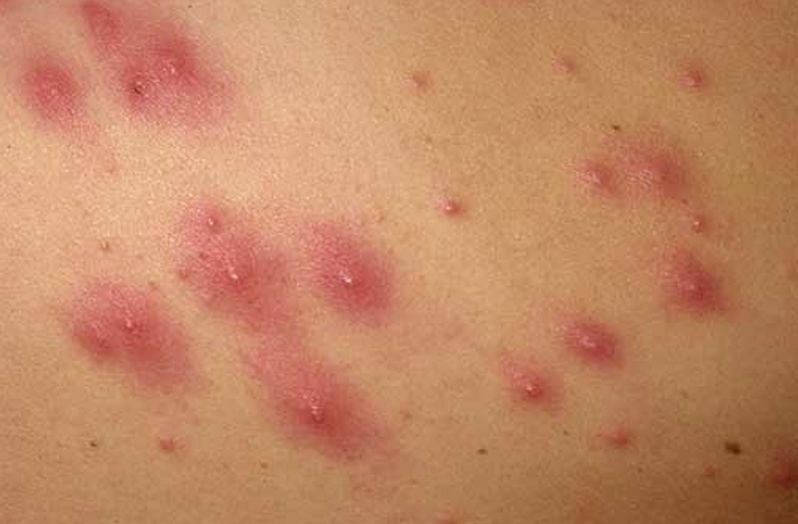 The most common symptom is small red itchy bumps that resemble bug bites and acne. 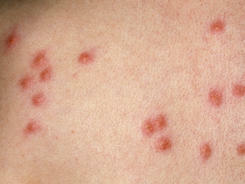 Your skin may also become covered in scabs or look scaly in the infected area. Unfortunately, the mite themselves are not easy to find because they burrow into the skin. The burrow looks like a small, scaly line with a tiny black speck on the end. The only way to treat scabies is with a prescription medication. It is important that you schedule an appointment with your doctor if you have a red, itchy rash that does not disappear. You also want to visit your doctor if others you live with have an itchy rash, or if they have been diagnosed with scabies. An inflammation of the skin is generally called dermatitis. It may be caused by a variety of things and can take on many forms. Most of the time, however, it is presented by an itchy rash and swollen, red skin. The skin that is infected may also blister, ooze, or flake off. 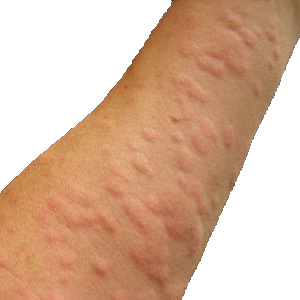 Eczema, dandruff, and poison ivy rashes are examples of dermatitis. The best thing you can do is avoid scratching. The scratching will make the skin even more irritated or cause it to become severe enough to need an antibiotic. Thoroughly clean with warm, soapy water. Mix 2 Tbsp. of baking soda with water to form a paste that you can apply to soothe the skin. Apply a cold, damp cloth to the infected area. Use an antihistamine to reduce the itching and allergic reaction. Dermatitis normally disappears on its own and is not a severe health concern. However, there are cases when you need to seek medical attention. If the rash is near your mouth or eyes, covers a large section of your skin, or does not improve on its own then you need to visit your doctor.